As a presidential candidate, Donald Trump promised a radically different approach to foreign intervention than that of his predecessors. At campaign events, Trump railed against U.S. military intervention so frequently that it eventually became a part of his stump speech. In his first year as president, Pentagon data suggests Trump has struggled to carry out his “America First” approach to the world, at least when it comes to the use of force. U.S. Vice President Mike Pence poses for photos with troops at Bagram Air Base in Afghanistan, Dec. 21, 2017. Instead, Trump has sent more U.S. troops to conflict zones in the Middle East and South Asia. He’s dropped more bombs on Iraq, Syria, and Afghanistan. And he’s expanded a global campaign of targeted drone killings. Add it all up, and it’s hard to see how Trump’s foreign policy is any less interventionist than his predecessors. If anything, Trump’s policies are a little more hawkish than those of Barack Obama, says Christopher Preble, with the CATO Institute. “He’s largely continued what he's inherited, with some additional increment of the use of force,” says Preble. Perhaps no conflict exemplifies Trump’s approach more than Afghanistan, where the U.S. has been fighting Taliban insurgents for 16 years. Before becoming president, Trump was a regular critic of the war, calling it a waste of lives and money and demanding an immediate withdrawal. But six months into his presidency, Trump reversed his position, instead deciding to indefinitely extend the U.S. commitment to Afghanistan. Under Trump’s plan, 3,000 more U.S. troops will be sent to Afghanistan, backed by an expanded U.S.-led bombing campaign. According to U.S. military figures, the NATO coalition is on pace to triple the number of bombs dropped on Afghanistan in 2017 compared to the previous year. The bombing could continue to expand in 2018, in part because of the relaxed rules of engagement that allow the U.S. military to go after insurgent targets. It’s part of a larger pattern of a bigger Pentagon footprint across the Middle East, South Asia and North Africa. Since Trump took office, there has been a 31 percent increase in the number of U.S. troops and civilians working for the Pentagon in the Middle East and North Africa, according to Pentagon data. That includes increases not only in well-known conflict areas, such as Iraq, Syria and Afghanistan, but also in Kuwait, the United Arab Emirates, Qatar and Bahrain. The U.S. military also recently acknowledged it has about 2,000 troops in Syria - four times as many as Pentagon officials previously said. According to a recent report, the U.S. forces will stay in Syria indefinitely. Under Trump, the U.S. is also dropping more bombs. 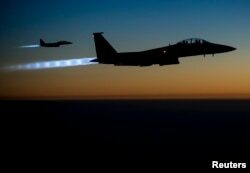 FILE - A pair of U.S. Air Force F-15E Strike Eagles fly over northern Iraq after conducting airstrikes in Syria, in this U.S. Air Force handout photo. The international coalition fighting the so-called Islamic State group in Iraq and Syria is on pace to drop 30 percent more bombs in 2017 compared to the previous year, according to official figures, though that campaign appears to be winding down as the Islamist group is forced out of its so-called caliphate. Drone strikes have also continued in non-battlefield settings, including Yemen, Somalia, Pakistan, and Libya - a continuation of President Barack Obama’s global campaign of targeted killings. "If Obama expanded the U.S. drone program, Trump has expanded it even more, both in terms of geography and frequency,” says Rachel Stohl, who specializes in drones at the Stimson Center, a research group. In Yemen, U.S. airstrikes have tripled, and in Somalia they have doubled this year compared to last, according to Jessica Purkiss with the Bureau of Investigative Journalism, which tracks U.S. drone and other airstrikes. "The uptick in strikes in these countries is largely because parts of both these countries were declared areas of active hostilities, which effectively means the U.S. can launch strikes with fewer constraints,” Purkiss says. The U.S. military could also soon conduct drone strikes in Niger, after the African country last month granted the U.S. permission to conduct armed drone flights. Trump's hawkish tendencies aren't surprising to some analysts, such as the CATO Institute's Preble. "The totality of Donald Trump’s statements as a candidate, and even before, did tend to be fairly hawkish," he says. As a candidate, Trump did, after all, vow to "bomb the s**t" out of Islamic State. He also consistently threatened to "take the oil" as compensation for U.S. military intervention in countries such as Iraq and Libya. And he pledged to make the U.S. military more powerful than ever. "That’s not exactly an argument for not fighting wars that he didn’t like," concedes Preble. Trump isn't the only president who has struggled to fulfill his campaign promises on foreign policy. President Obama, for instance, campaigned on bringing U.S. troops home from Iraq. And he did, before eventually sending them back to fight Islamic State. It's perhaps a reminder that presidential candidates promise a lot when it comes to foreign policy. But they can't always deliver.